A substantial and very well-presented modern yet characterful 4 bedroom country residence set in 6.32 acre of gardens and grounds in an edge of village location. Carport, stables and general purpose outbuildings including approx 5.5 acres of productive pasture land. Far-reaching countryside views. Situation - The property is situated on the edge of the rural village of Meeth, which has a church and The Bull & Dragon public house. The market town of Holsworthy, situated approximately 17 miles to the south-west, provides a range of domestic, commercial and leisure facilities, including 18-hole golf course and a swimming pool. A number of independent retailers and businesses surround the town's square where a weekly market is still held every Wednesday. Okehampton, approximately 11 miles to the south, offers a variety of individual shops and a choice of 3 supermarkets, a modern hospital with minor injuries unit, medical centre, and a range of recreational and educational facilities including primary and secondary schools and a college. The market town of Hatherleigh is situated approximately 4 miles to the south with a supermarket, a doctors surgery, veterinary practice and The George Pub. Communications - Road The A30 is accessed 13 miles to the south at Okehampton connecting with the M5 at Exeter. Rail Regular intercity services operate from Exeter to London. Sea Ferry services operate from Plymouth to northern France and northern Spain. Air Newquay Airport offers flights to numerous destinations including London Gatwick. Exeter International Airport provides daily flights to London City Airport and flights to the Isles of Scilly, Channel Islands, Ireland, Scotland and a number of continental destinations. Bristol International Airport offers flights to numerous European destinations. Recreation - Horse Riding & Walking Horse riding is accessible via country lanes in the area. The North & South West Coast Path also offers scenic walking and further walking and riding are available nearby on the Tarka cycle trail (Brauton Meeth) and on Dartmoor and Bodmin Moor. The Property - The property Is situated in an edge of village location and within easy reach of Okehampton, Holsworthy and the north Cornish coast. This spacious and very well-presented property was built in the early 2000's of timber frame construction, providing flexible and comfortable family living. 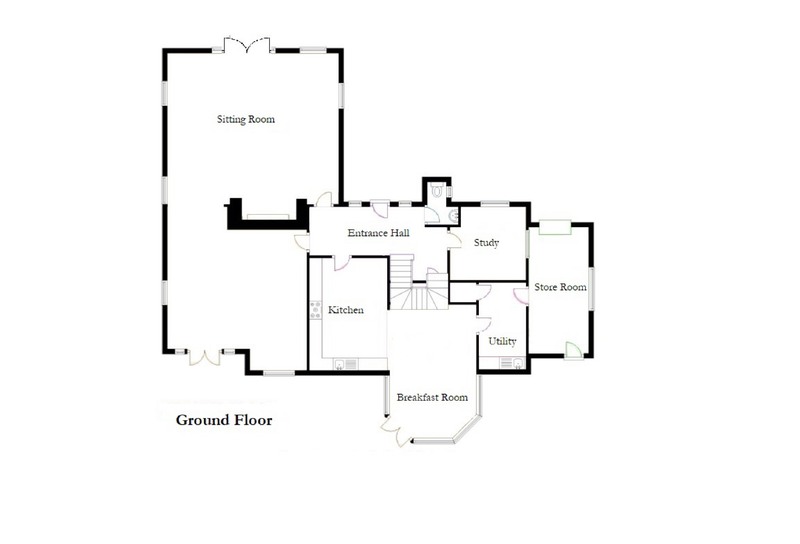 The accommodation briefly comprises: Entrance Hall, Cloakroom, Study, Sitting Room, adjoining Second Sitting Room, Kitchen/Breakfast Room, Utility Room, and Store Room with direct access to the outside. 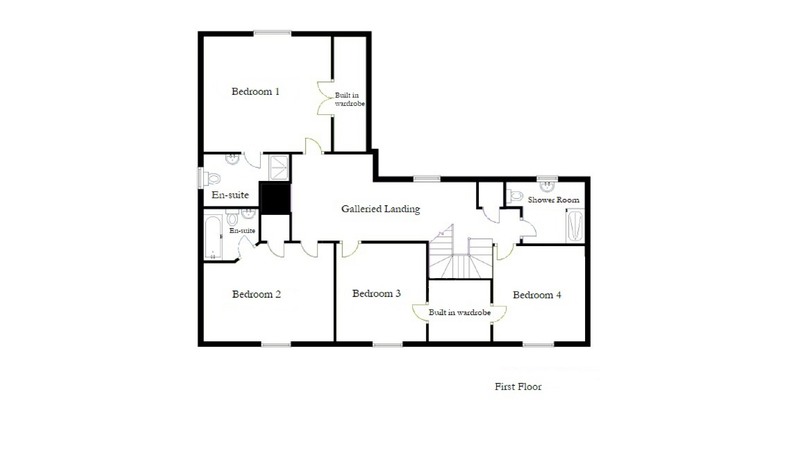 On the first floor: 4 Double Bedrooms (2 En-suites) and a Family Bathroom. The house is set in landscaped lawned gardens with fruit trees in the front garden and a lawned garden to the rear with a feature fishpond. The undulating land extends to approximately 5.5 acres of pasture land and is split into 7 manageable enclosures conveniently located adjacent to the outbuildings and driveway. The accommodation briefly comprises: Entrance Hall, Cloakroom,Study,Sitting Room, Secondary Sitting Room, Kitchen,Breakfast Room, Utility Room, Storage Room and on the first floor Galleried Landing, 4 Double Bedrooms (2 En-suite) and a Family Bathroom. Entrance Hall: - 4.90m x 2.24m (16'1" x 7'4") - Double glazed front door, exposed timber beams and wood effect floor finish. Sitting Room : - 6.90m x 4.70m (22'8" x 15'5") - Exposed beams and with a large inglenook fireplace with a Gazco LPG fire. Secondary Sitting Room: - 5.83m x 5.81m (19'2' x 19'1) (19'2" x 19'1" ( 62'4" x 62'4") - Exposed brick fireplace with a Villager' LPG fire. Kitchen: - 4.60m x 3.17m (15'1" x 10'5") - Fitted Howdens Kitchen with Neff electric double oven and induction hob. Gardens & Grounds - The lawned gardens at the front of the house are interspersed with trees. There is a decked area which can be accessed through double doors off the sitting room. To the rear of the property is an enclosed lawned garden interspersed with trees and a fishpond with water feature. Beyond the garden are the paddocks. Buildings - Situated adjacent to the property and accessed from the main gravel driveway. Double Kennels With Yard: - 3.62m x 1.56m (11'11" x 5'1") - Enclosed concrete yard. The Land - The land extends to approximately 5.5 acres (2.25ha) of grassland divided into 7 easily managed enclosures all with stunning countryside views. Mains water supply. Tenure - The property is offered for sale freehold with vacant possession on completion. Local Authorities - West Devon Borough Council, Kilworthy Park, Drake Road, Tavistock, Devon, PL19 0BZ. Tel: 01822 813600. South West Water, Peninsula House, Rydon Lane, Exeter, Devon EX2 7WP. Tel: 01392 446688. All viewings are to be accompanied without exception. Walking the land unaccompanied is strictly forbidden as there is livestock on the land.